Maybe you have heard about this and maybe you haven't but Bugatti certainly has. It seems that the automaker believes in its new Divo. Indeed, Bugatti showed a "limited number" of Bugatti owners its new line-topper and as a result, they have sold every copy, all 40 of them. They have also added $240 million to their coffers. Wow is the only word for this feat of automotive legerdemain – selling out an entire line of hypercars as soon as they in under two weeks or so. This is exactly what happened to Volkswagen’s Bugatti Divo in the last couple of weeks. Take the “small group of selected Chiron customers” that viewed the Divo recently. All 40 units of the coupe, based on the Bugatti Chiron, were purchased almost immediately. Putting numbers on the sale, when the dust had settled from the stampede to purchase a Divo, the automaker had a cool $240 million in its coffers. Each copy of the Divo cost roughly $6 million. Bugatti’s President Stefan Winkelmann disclosed the sellout in a draft statement sent to reporters. That is an amazing figure for someone’s daily driver. Because it is a street legal hypercoupe, Bugatti had to do a bit of tuning to keep everyone happy. Designers tuned the Divo for agility, nimbleness and top handling performance on winding roads. Indeed, the tuning was so successful that the Divo could take on the Nardo handling circuit in Southern Italy and push through it 8 seconds more quickly than the Chiron, Bugatti’s current $2.8 million top of the line. Winkelmann said the engineering staff tuned the Divo for higher performance than the Chiron. The Divo has better lateral acceleration, agility, and cornering. “We have shifted the balance further toward lateral acceleration agility, and cornering,” the company said in a statement. Interestingly, the Divo shares the Chiron’s 8.0-liter, W-16 engine. The street-legal powerplant cranks out 1,480 horsepower. To make the Divo handle as exquisitely as it does, Bugatti extensively fine-tuned its aerodynamics. The engineers also made extensive modifications to the suspension and chassis settings. The designers also trimmed the weight to better the Divo’s cornering. Indeed, the engineers developed a new structure for the car’s front end. 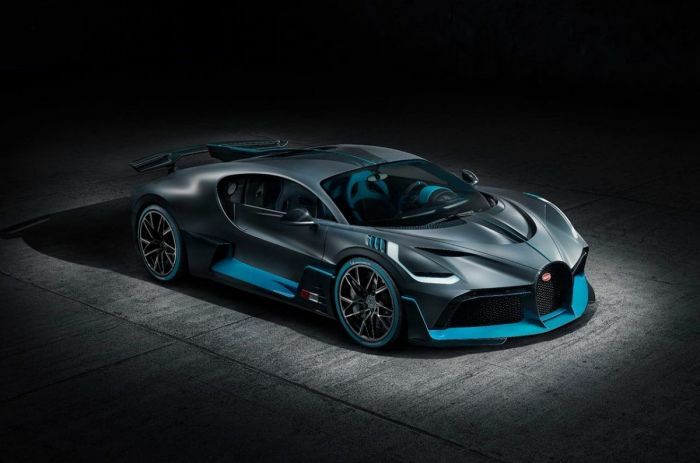 According to Bugatti, the improvements have enabled the automaker to optimize an “air curtain” which improves the airflow over the front and rear sections of the Divo. A widened spoiler provides more driving downforce. The system guides more air to the front air inlets, improving airflow to the front air inlets so the there is better airflow up front while the cooling system receives better air flow. The efforts improved overall cooling. When Bugatti decided to let its engineers loose on the Chiron, the automaker gave the staff carte blanche to improve things. For example, engineers made a host of alterations to the styling and size of the rear wing and rear diffuser. The goal of these changes was to ensure the Divo kept its wheels firmly on the ground. The rear spoiler is 72-inches wide – 23 percent wider than on the Chiron. The widened spoiler not only improves downforce but it also means brake performance is better as the brakes have much better grip. The improved rear diffuser generates added downforce, as well. Also, the engineers made some thermodynamic improvements to various vanes, heat shields, and air ducts. The changes include a high-flow duct in the roof designed to put more air into the engine compartment to help cool the engine. The result is a vehicle that brings the form to performance, said Achim Anscheidt, chief designer. The Divo was launched this week at the Pebble Beach Concours d’Elegance in California. Named after Albert Divo, a World War I French fighter pilot and later racecar diver, he won the Targa Florio twice. The Targa Florio is a famed race along the mountainous roads of Sicily. Divo was behind the wheel of a Bugatti.